We are an Evangelical Christian church located in Potsdam, NY that seeks to serve our local and global communities. Join us for a worship service each Sunday at 11:00am. Please check our calendar for other event times. Rev. 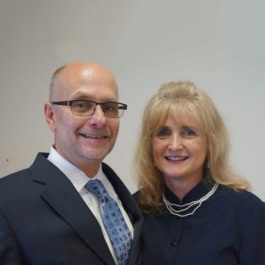 Duane (Bud) Leach received his Bachelor of Arts in ministry: Pastoral Ministries, at the Nazarene Bible College in Colorado Springs, Colorado and Masters of Arts in Ministry with a focus in Missional Leadership from Northwest Nazarene University. Rev. Bud and wife Cindy moved to Potsdam on July 16, 2015 from Armada, Michigan. They have a daughter, Jennifer living with her husband in California and two sons, Jacob & Joseph living in Michigan. In addition to the regular staff, we also maintain a church board which informs and guides the church. Mary Lee Ten Eyck currently serves as the office manager for the church. She assists the pastoral staff and serves the congregation through her skills of administration. Reach her at he church office.